After beginning construction two and a half years ago, the Ritz-Carlton Residences have finally topped off at 52 stories. The beachfront development features a total of 212 luxury condos. The milestone was celebrated by developers and the contractor at separate events. Amenities include a 33rd floor private club with a media room, library, bar, lounge and guest suites, a 4th floor lap pool, two spas, an oceanfront wellness center, first-rate restaurant and kids club and more. Miami Beach commissioners approved the construction of the 44-story tower proposed by Crescent Heights. The approval comes in exchange of developers agreeing to fund a 3.2-acre park and other public benefits in the vicinity. The luxury tower is slated to rise 519 feet and house a total of 410 condo units. While the park has a construction deadline of 2.5 years, the condo tower should be completed within eight years, as per the approval guidelines. Brickell’s riverfront is all set to gain 70 condo units, 198 hotel rooms, and 122 parking spaces, as the Edge on Brickell wins key zoning waivers. The boutique condo hotel will occupy a narrow riverfront lot and feature a riverwalk. Developer, Brick Group also plans on including restaurants at the ground and rooftop levels of the luxury condotel. Developer Deco Capital Group managed to gain key approvals for its Sunset Harbour development from two Miami Beach boards this past December. The scaled-back development will occupy roughly 67,000 sq. ft. of Purdy Avenue. The five-story development is set to feature 20,000 sq. ft. of retail space at its ground level, housing two cafés, two large restaurants and four traditional retail units. The next level will be dedicated to parking. And, the top three stories will feature condos ranging between 2,900 sq. ft. and 3,700 sq. ft. in space. Construction is expected to begin in 2020. Adding to its kitty of five-star amenities, developers are planning on offering residents a brand-new beach club called Museum Beach. The facility is expected to be located in the South of Fifth area. This 709-feet tower is the only high-rise designed by the late Zaha Hadid in Miami, and is expected to be completed in the first quarter of 2019. Other amenities at this ultra-luxury condo tower include an 8th floor pool deck and fitness center, a 9th floor spa and relaxation sky lounge, plus a 5,600 sq. ft. ground-level restaurant, along with a host of other special features. Developer OKO Group filed for a construction permit for its one-acre, waterfront development in Brickell this December. The 613-foot tower is set to feature 138 luxury condos sprinkled across 47 stories. Amenities at this ultra-luxury development include a third floor dedicated to three pools, an outdoor lounge, cabanas and grilling area, a waterfront spa and fitness center, private marina, cinema and more. Luxury residences at Una will also feature underground parking and a public Baywalk landscaped by Enzo Enea connecting to a park nearby. An application has been filed, yet again, with the Federal Aviation Administration by developers of One River Point. This time, the FAA-application has been submitted for the construction of an 817-foot tower. Previously, the condo project had already received FAA approval to build a 928 feet tall tower. However, the approval was set to expire by September 2018, and it did, since the twin-story tower missed starting construction by said date. The 60-story tower is planned to include a dramatic floating Sky Bridge connecting both towers, a signature waterfront restaurant, the largest riverfront full-service pool, B&B Italia-furnished cabanas, a sculpture garden, pet spa, curated exhibition spaces and much more. PDS Development nabbed another $50 million loan to add to its previous $90 million bridge loan to fund both its luxury properties in Fisher Island. The previous loan was taken in January 2018. Just like the previous loan, this one too will be used for the sell-off of remaining units at (completed) Palazzo Del Sol, and the construction of Palazzo Della Luna. 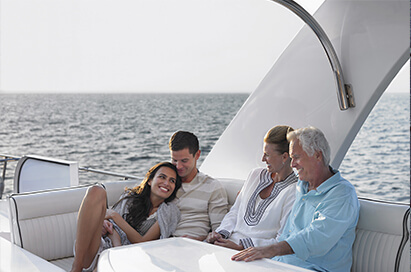 Occupying the last waterfront parcel on Fisher Island, the ultra-luxury development is accessible only by private yacht, the island’s auto-ferry or helicopter. The 10-story, 50-unit boutique building shares a “Central Park” with sister development Del Sol, which includes outdoor tea gardens, a croquet lawn, bocce ball court, yoga lawn. Other highlights include a beauty salon, multiple pools, cabanas, pool bar, spa, fitness center, massage suites and more. After breaking ground in November 2018, developer KAR Properties has secured a $103 million loan for the construction of its beachfront condo project. The luxury development is set to rise 38 stories and feature 64 condos, all outfitted with designer furnishings from Minotti. While 58 of the condos will be half-floor residences, five will be full-floor penthouses spanning 6,000 sq. ft. each. Private beach amenities here include cabanas, chaise lounges, umbrellas, a fireplace and towel service. Other amenities include an oceanfront and sunset pool with butler service, a Spa Pavilion with Hammam and ice room, oceanside café by Wright Fit, sculpture garden with commissioned artwork by David Harber, curated gardens by Sasaki and an oceanfront library. The Verzasca Group secured a $25.7 million construction loan for their 17-story condo tower in Sunny Isles Beach. The 61-unit building is 70% presold and expected to go vertical in the first quarter of 2019. Amenities include a sprawling pool deck, open-air yoga garden, kid’s zone, beach concierge and a private garage with 10 electric car-charging stations. Subscribe for monthly updates on such and more condo pre-construction news in Miami.